Alpinestars Spartan Gloves are spartan. Seriously, they are gloves and that is about it. If it had less features, the tip of your pinky would be exposed. That's not necessarily bad because some riders don't want to bother with leather race gloves on those hazy summer days. Spartan gloves are no frills warm weather gloves for riders who want lots of air flow and a basic level of protection. The spandex and air mesh upper of the Spartan glove provides flow air, while knuckle reinforcement provides impact protection. Clarino synthetic leather defends against abrasion at the palm and thumb, while bolstering the area against wear and tear from rubber grips. The neoprene cuff and velcro closure keep the glove a in place during those hot summer rides. Alpinestars did not forget about the ladies. 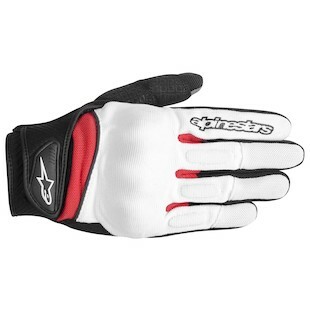 The Alpinestars Stella Spartan Gloves provide the same features, but in a fit optimized for females. My vegetarian girlfriend would rather not put her hands into goatskin palms and the synthetic Clarino is a great option for her. If it is too hot for full leather race gauntlets, reach for a pair of Spartan gloves. They will provide decent protection in a lightweight airy glove.